“Sew Happy!” with artist, Libbie Soffer, each Wednesday from 10:30am-2pm in the Cohen Gallery. For the duration of the exhibition, Libbie will be leading weekly mending circles where guests are encouraged to bring a sewing project to work on with the helpful support of other sewers. Perhaps you crochet, knit, spin, embroider, repair, hem, or reconstruct using older garments. This is your chance to join with like-minded people who prefer to personalize their wardrobe or home environment with self expression. It’s a great opportunity to share your project ideas and get feedback. Sewing machines, scissors, iron and ironing board, needles, pins, thread, work tables, and chairs will be provided. You supply the project. 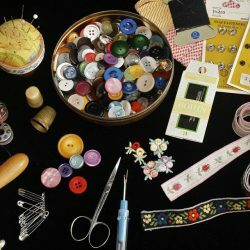 If your project requires special items, like fabric scraps, trims, or buttons, please bring them along. Beginners through advanced skills welcome. Sew Happy Mending Circles are free and will be offered each Wednesday through May 23rd. There is no cost to participate, but space is limited and advanced registration is required. To reserve your space, please email Suzanne Fellows by 5pm on the Tuesday prior to your visit.